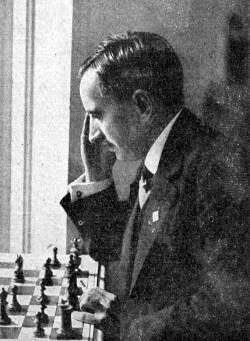 This is from a simul game played in 1926. Black was one of the players against International Master Carl Oscar Ahues. Ahues was born in Germany in 1883. He was Berlin champion in 1910 and German Champion in 1929. His son Herbert Ahues is a famous chess composer. You can read more about him here. In this position below, Ahues had sacrificed material to gain attack and here played 1. Qxf6 with mating threats. If you run the flash below you will see that Black cannot take Queen with 1. ... gxf6 as mate will follow with 2. Rg3+ Kh8 3. Bxf6 1-0. So Black resigned! Do you think Black had a way out? Think about it before looking at the solution in the second flash diagram. This is the answer but don't run it till you think a bit!